For the past several years, the New England Aquarium has participated in a joint expedition to Fiji, along with the Monterey Bay Aquarium and other conservation-minded groups and individuals. The last expedition took place in October and November 2010. 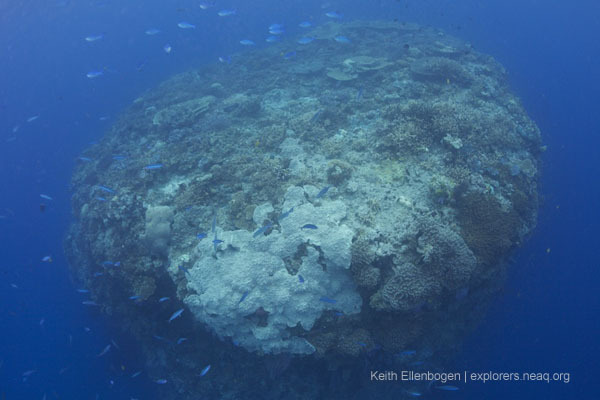 Today's post about exploring Fiji's underwater seascape through a camera lens comes from underwater photographer and regular Explorers Blog contributor Keith Ellenbogen. 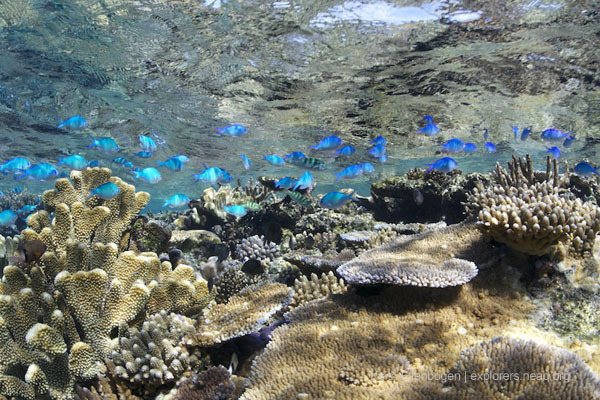 Beneath the surface of Fiji’s clear blue seas are schools of fusiliers, anthias, damsels and a myriad of other colorful fishes that appear to be dancing to a rhythm that only they can hear. To me— the observer and not a performer — it is like a well orchestrated and choreographed underwater Broadway Show. The performance is all around me, on many stages simultaneously. Overwhelmed, I’m able to take in only a few of the many scenes or acts that are there to be enjoyed. The diverse and vibrant color palette, coupled with a seemingly infinite diversity of shapes, sizes, and methods of movement, all combine to create images of underwater seascapes that demand that the observer take special note and commit to memory. It is a world where nature is clearly in constant motion, changing, and revealing secrets right before my eyes. As I now reflect on this recently completed assignment, I'm sharing a few of my favorite images here. I’m hopeful that they communicate something special, maybe inspiring you to go there yourself, or if you can’t, perhaps a feeling that you need to support and protect this beautiful place that I’ve been lucky enough to visit six times. I will need to return to it soon. Take a look at all of Keith's posts and see more of his pictures here on the Global Explorers Blog. 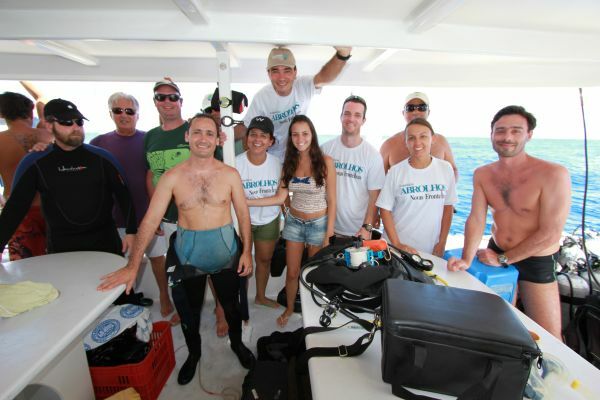 Les Kaufman, New England Aquarium research scholar, is in northern Brazil to study the unique marine habitats of the Abrolhos Shelf with scientists from Conservation International and local universities. He and fellow researchers intend to learn more about the marine life of Abrolhos, its links with terrestrial communities, how both are likely to be affected by global climate change and what people can do to protect this special place and oceans worldwide. Read his previous entries from this expedition here and here. We did it. We’ve succeeded in dodging the weather to complete the last three legs of Expedicio Abrolhos: Novas Fronteras. This entailed four days of ROV and drop camera exploration of the central southern and eastern Abrolhos shelf, three days remote and SCUBA work at buracas on the eastern shelf and several more days of sharing our discoveries with press and media journalists. A diver swims over a buraca covered with seaweed on Brazil's Abrolhos Bank. Depth: 35 meters. As always, the sea has not failed to surprise, confuse, illuminate and reorient us. Moreover, it’s armed us to move ahead with better measures to conserve and benefit from all this new stuff...realizing that Brazilians have been depending upon these systems all along, even if only a handful of people knew it. 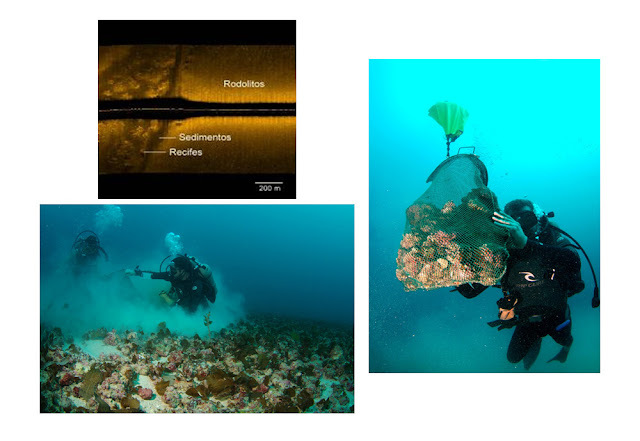 On previous expeditions, side-scan sonar had revealed that the area of hard sea bottom on the Abrolhos Shelf was twenty times larger than we’d once thought. The question is: What actually lives on this hard bottom? Is it all deep coral reef? 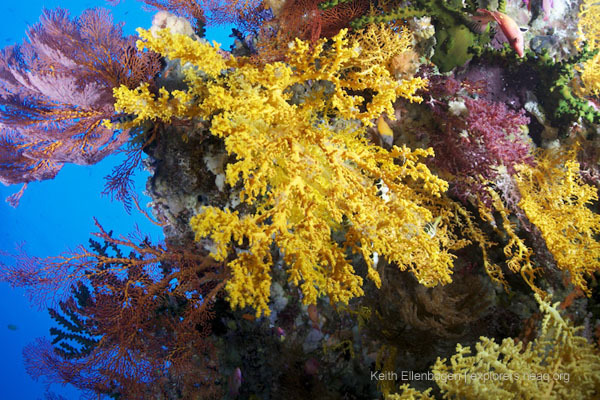 Deep reefs with very high live coral coverage have been discovered elsewhere. We’d hoped it might be coral, as we are worried about the future of one brain coral in particular: Mussismilia brasiliensis, the major reef builder on the Abrolhos Bank which is found nowhere else in the ocean. 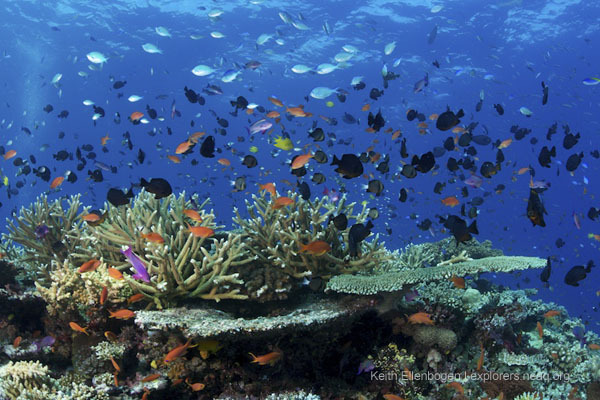 If not reef-building corals, then what? Well, what we found in these newly explored areas seems mostly to be ancient reef framework, overgrown by diverse living organisms and, like other reefs, densely inhabited by fishes. So these outer shelf mesophotic reefs are interesting, vibrant and important to many things people care about…but the corals are few and far between. That means that the Mussismilia reefs near shore are are really important... every effort must be made to nurture and protect them. 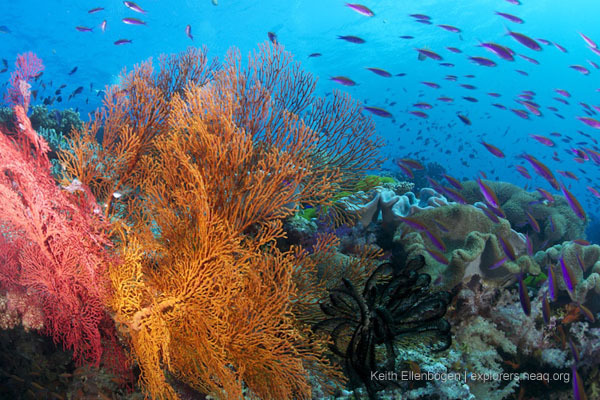 And these are the reefs most vulnerable to overfishing, deforestation, coastal pollution and over development. Some of the biggest surprises on the expedition were all about algae. The rhodoliths we were anticipating. What we were not ready for was the seaweed. Untold amounts of it. Brown, green and red fleshy algae carpeting rhodolith beds as far as the eye could sea — and as near as we could tell, accounting for thousands of square miles of shelf habitat. The other big surprise had to do with the buracas. Some of these, especially in summer time, become filled up with algal fronds — and we’re talking a lot of seaweed to fill up an entire buraca. 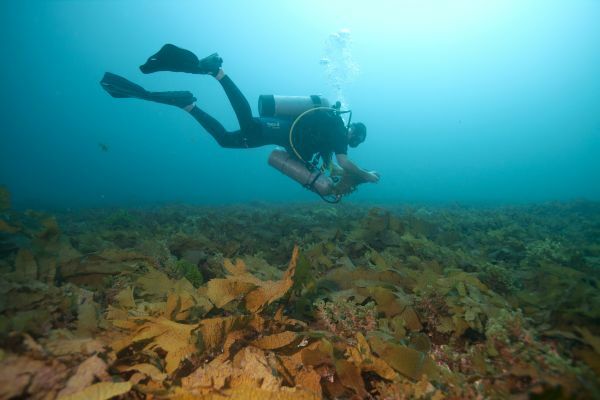 The seaweed ferments, releasing precious nutrients, and generating a build-up of gas. While we were positioned over one particular buraca, a large amount of material was jettisoned, and made its way all the way to the surface beside the boat, releasing an overwhelming stench. The implication of this is profound. 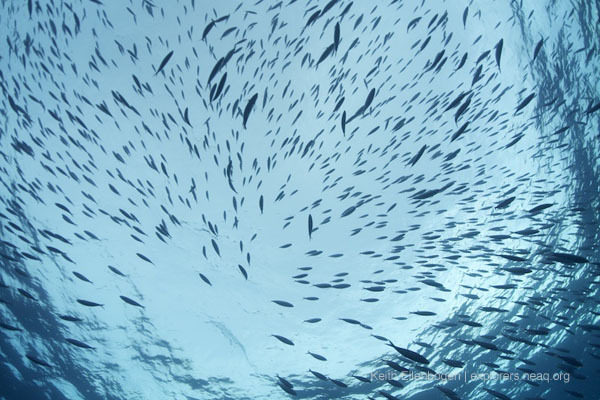 Buracas could play an important role in nutrient cycling on the outer shelf. And not just that. 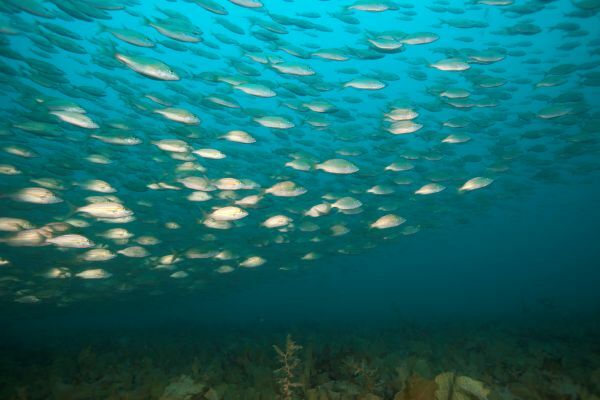 Hovering over many buracas are enormous shoals of fish, mostly members of the grunt family, and of these, mostly two species: tomtate, and a form of white grunt (Haemulon plumieri) that is actually yellow. This fish, though very familiar, is quite possibly a valid but undescribed species unique to Brazil. It would not be the first. The field portion of Expedicio Abrolhos: Novas Fronteras has concluded. It was an amazing journey of discovery, with kudos to Drs. Rodrigo Moura and Guilherme Dutra for pulling off a monumental effort that involved at least three vessels, more than 60 scientists and stretched over two months offshore, with many complicated legs, technical challenges and crew change-outs. We have made some fantastic finds. Our conceptions of the great ecological machine that is Abrolhos — what it is made of and how it works — has been expanded and transformed from the fuzzy early notions we carried with us out to sea, to a picture, now sharp and startling but still rife with mystery, of a huge new world. Les is also working with Conservation International during this expedition. You can find his entries are cross posted on their blog. 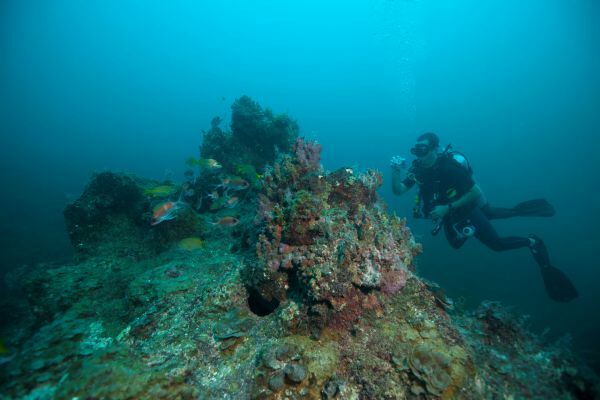 Les Kaufman, New England Aquarium research scholar, is in northern Brazil to study the unique marine habitats of the Abrolhos Shelf with scientists from Conservation International and local universities. He and fellow researchers intend to learn more about the marine life of Abrolhos, its links with terrestrial communities, how both are likely to be affected by global climate change and what people can do to protect this special place and oceans worldwide. We have just returned to Conservation International's office in Bahia from three days at sea where our team explored the deep, central shelf using technical diving and a remote operated vehicle (ROV). This region is a vast carpet of rhodoliths: roughly spherical objects constructed by many layers of hard red algae. Rhodolith fields like this one represent a reservoir of carbon that could play a significant role in regulating global climate - but to know just what that role might be, and how significant a role, we must learn more about them. 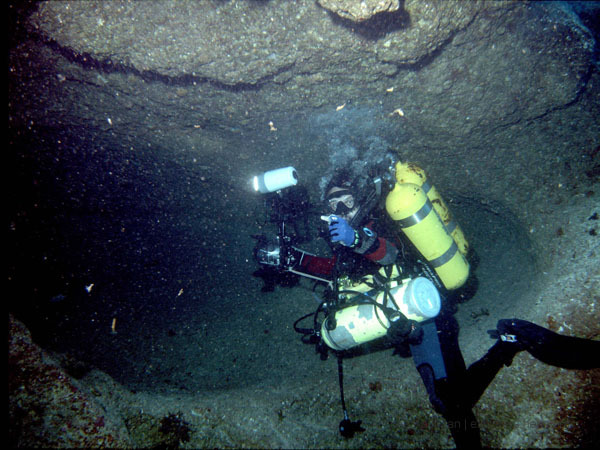 Rhodoliths were brought to the surface from depths of 70 to 80 meters (230 to 262 feet) by divers using a special gas mix that reduces the chances of decompression sickness, also known as the bends. When we opened the rhodoliths, we saw that boring by excavating sponges, clams and other organisms is minimal — a sign that the carbon may be stable and not quickly reentering the ocean, and then the atmosphere. One scientist on our expedition is studying the creatures that live in and on the rhodoliths, many of which appear to also be species that also live on coral reefs. Other scientists are using the rhodoliths to study changes in ocean and coastal conditions over time. The other big item bagged in the last few days is a collection of specimens from buracas — deep holes in the outer Abrolhos Bank. Buracas are often full of fish, and so we want to get a better look at their function as "inverted coral reefs" and learn how they are formed. Today, we head out for another four days of reconnaissance using the ROV — exploring places we still know little about, some of which are in areas where greater protection has been proposed. 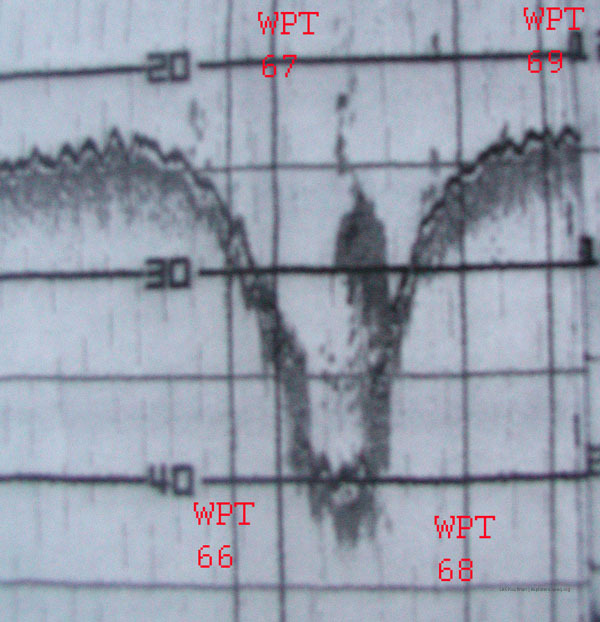 Echogram of a buraca, or deep hole in the continental shelf. Such holes are sometimes filled with rhodoliths, while the walls are ancient coral reef framework, about 30,000 years old. The weather is promising and our new course is plotted, so out we go for the next Brazilian adventure at sea. Les is also working with Conservation International during this expedition. His entries are cross posted on their blog.